For our sons sixteenth birthday, we paid a visit to the Houston Space Center. None of us had ever been to any of the NASA sites before so we were really looking forward to it. The Houston Space Center has one of the decommissioned shuttles (Endeavor) mounted on the converted 747 carrier aircraft, which was super cool. They have a full, unused (of course) Saturn 5 rocket and many smaller exhibits. You can also take a guided tour of the Johnson space center and Houston’s famous ‘mission control’. We saw all of these things and took the tour and it was all large and impressive and slightly sad. In the spring of 1981 I was a 10 year old in primary school in a small yorkshire village in England. The head teacher (there were only two teachers in the whole school) cancelled classes for the day as we spent the day watching the first space shuttle launch on live broadcast from Florida. I remember that this took pretty much the whole day as the launch was delayed multiple times and we spent a lot of the waiting looking out of the windows at the unseasonably warm and sunny weather wanting to get out there and play. That was 37 years ago. The engineering for the shuttle started in 1968 – before I was born. The Saturn 5 rocket – which is even more physically impressive, originates in a design formulated in 1962 – 56 years ago. You could buy models of the Northrop T-38’s that NASA use for……well, I’m not sure what, probably training the astronauts but probably more for just hot-dogging and having fun. The first flight of the T-38 (F5) was 1959 – 59 years ago. These things are very impressive. They are also very old. To put that in context – when my 10 year old self went to a museum in 1981, exhibits that were 59 years old would have dated from 1922. 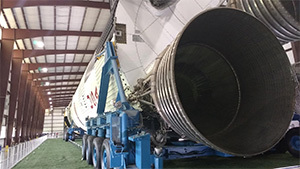 The Houston Space Center is a museum and it is full of old artefacts and exhibits. I loved it – this is the technology that inspired me when I was a child and seeing it up close was just great. The space shuttle and the 747 carrier aircraft were too sanitized and cleaned up to the point where the interiors looked like mock-ups . 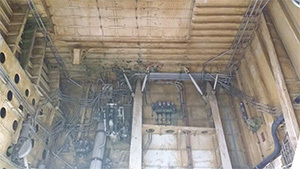 I had more fun looking up into the landing gear bay of the 747 because is was real – greasy and grimy and full of exposed systems, hydraulics, P-clamps, sheet metal and rivets…….but it was all great. It is also evident that NASA has much more to say about their past than their future. If you go the the NASA website it is difficult to find out what they think their mission is. I am not a fan of corporate mission statements but they are useful in providing clarity of purpose when nothing else does. The front page of the website (https://www.nasa.gov/) has some things they are doing – but no clue as to what the purpose of the organization is. The ‘about’ page (https://www.nasa.gov/about/index.html) is also unclear on why NASA exists. There is this phrase “NASA’s Vision: We reach for new heights and reveal the unknown for the benefit of humankind.” but you could use this same phrase for a Pentecostal church organization and it would probably be more relevant. How about “Exploring Space” or “Colonizing the Solar System” or “Making Manned Spaceflight an Everyday Event”. How about something….anything? The sidebar of the ‘about’ page lists the further web pages you can spend your time visiting that show how compliant they are with US federal requirements and standards: Privacy Program, National Aeronautics and Space Act, Open Government, Plain Writing, Information Quality, Communications Policy. Experienced university graduates (probably with doctorates) writing web pages filled with prose about internal NASA policies and procedures that demonstrate compliance with federal policies that give an acceptable method of compliance with federal regulations that ensure that NASA are fulfilling their important federal statutory obligations. Wow – I wonder how we ever got into space before we had all this. So, NASA has lost their way – their budget is not what it used to be and so their role cannot be what it once was. But, what is their role? 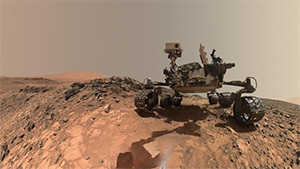 NASA has done some great work in recent years – the mars rovers are phenomenal and the data they have sent back from Mars is incredibly exciting and important. To put that in context the mars rover programs have cost $2.5Bn and have been running since 1994. Since 1994 Nasa has received (in 2018 dollars) $460Bn. The rovers have cost around 0.5% of the total NASA budget. Examination of all the goals defined in these documents that the organization is trying to achieve gives clear evidence of diffusion of effort and dilution of achievement. So what should NASA do? Should they exist as a research and artefact curating organization and slowly settle back into the role of maintaining the infrastructure from a time when they were funded and focused on their mission? Should they close down their museums, rationalize their budget and focus solely on getting people into space again? The Houston Space Center is worth a visit, we had a great day – it is a great reminder of what we can achieve – but not of what we are, or should be, achieving now.